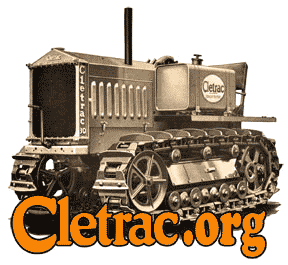 Cletrac.org > Cletrac Website / Forum Discussion > Cletrac Website / Forum Discussion > New Cletrac chat room! Give it a try. Maybe someone will take the lead and arrange certain times where Cletrac and Oliver fans can get together. Is anyone interested in setting up some times and being around to participate in the chats? Just choose a certain time every week and we'll try to get some folks together. We can have chats on various subjects. This is for you guys to have fun!! I tried it on Friday night - had a chat with Rusty. My first time in a chat room! Go to Polls - I've set up a question about time there. I have been thinking of an idea for the chat room. I dont want to be speaking out of place as Im a new comer here, but I belong to a few groups on Yahoo that they have a set time for the chat room its like Thursday night from 7pm till when ever. There is a good turn out most of the time. I know not everyone would agree on the same time but maybe it would be possible to have more than one time to! I think that its a good learning tool as well. You can learn alot more and get to know some of the members when your haveing a conversation so to speak. Anyhow just my thoughts. Keep up the great work ! If you go to the poll part of the forum, John D. is trying to see what time of the week most folks are interested in chatting. He gives a choice of each evening of the week. I agree the chats are interesting and I think they'll catch on over time. Unfortunately, with my schedule, I will only be able to join in the chats on a random basis. I'll mostly be able to chat while I'm on nights at work. Day shift is just too busy. Weekends might work too. I don't think the chat room is working anymore. I should take the link to it down when I get a chance. Sorry.